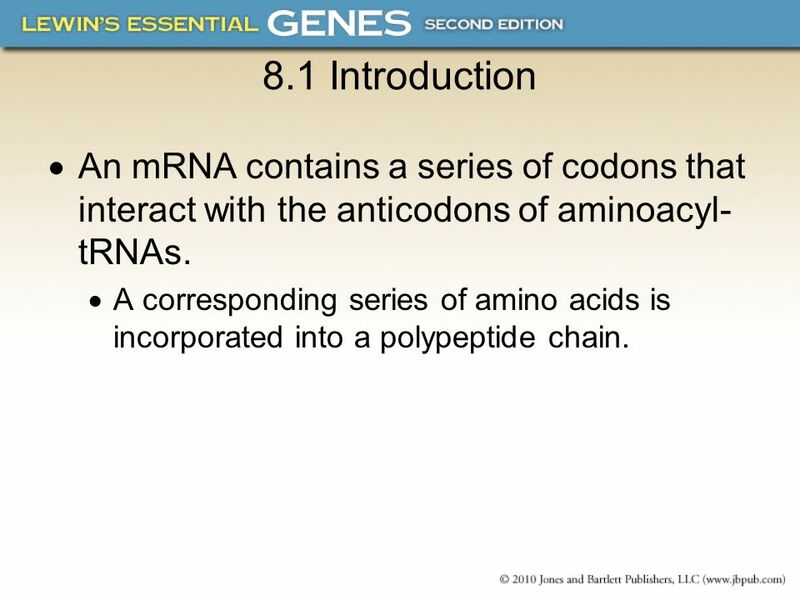 2 8.1 Introduction An mRNA contains a series of codons that interact with the anticodons of aminoacyl-tRNAs. A corresponding series of amino acids is incorporated into a polypeptide chain. 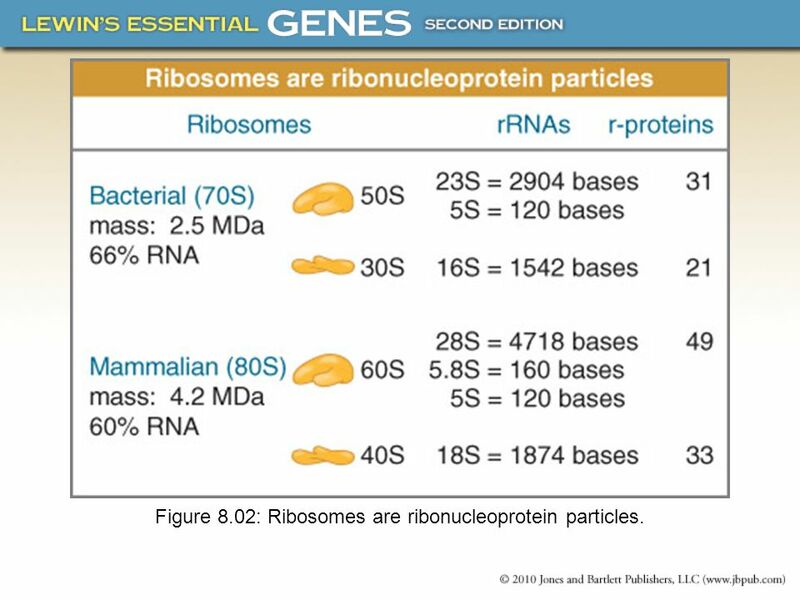 3 Figure 8.01: Size comparisions show that ribosome is large enough to bind tRNAs and mRNA . 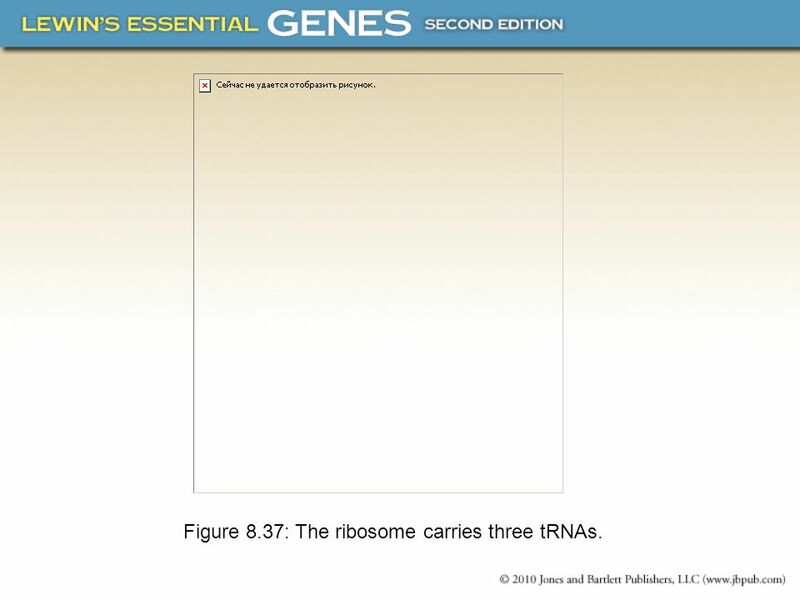 4 Figure 8.02: Ribosomes are ribonucleoprotein particles. 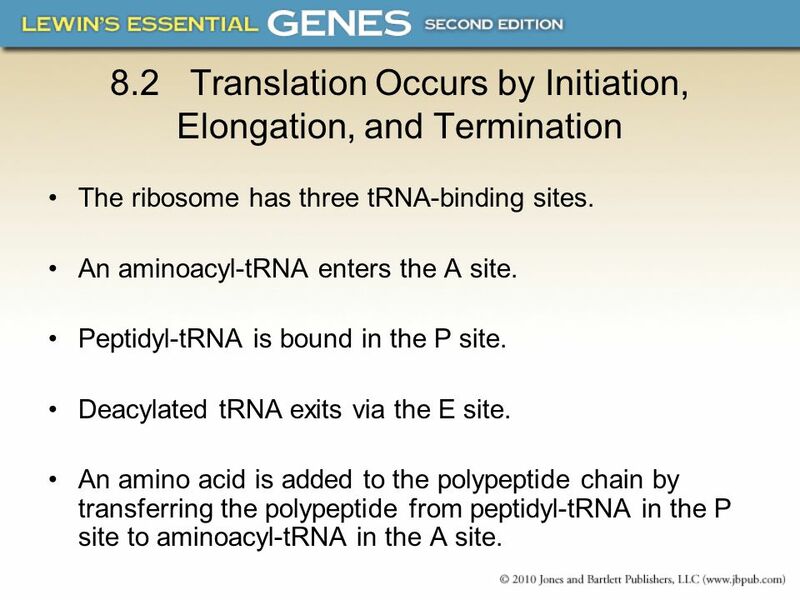 The ribosome has three tRNA-binding sites. An aminoacyl-tRNA enters the A site. Peptidyl-tRNA is bound in the P site. Deacylated tRNA exits via the E site. An amino acid is added to the polypeptide chain by transferring the polypeptide from peptidyl-tRNA in the P site to aminoacyl-tRNA in the A site. 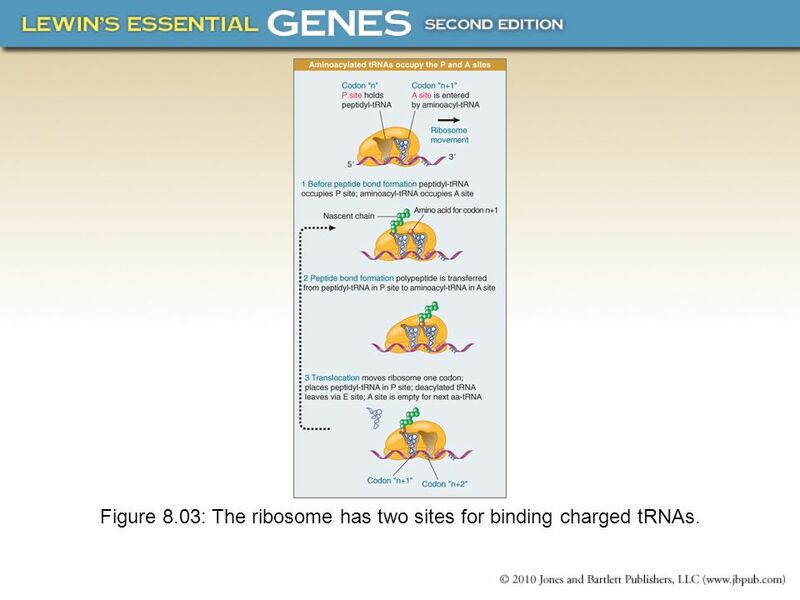 6 Figure 8.03: The ribosome has two sites for binding charged tRNAs. 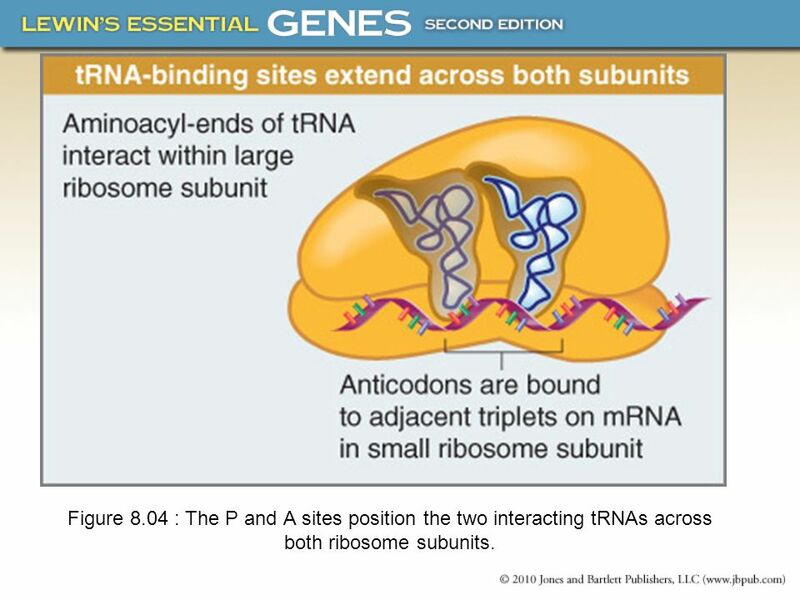 7 Figure 8.04 : The P and A sites position the two interacting tRNAs across both ribosome subunits. 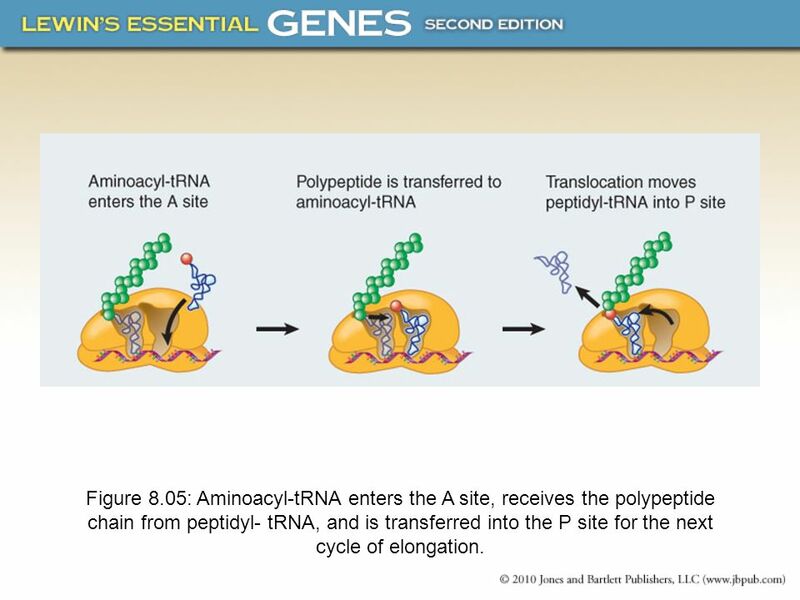 8 Figure 8.05: Aminoacyl-tRNA enters the A site, receives the polypeptide chain from peptidyl- tRNA, and is transferred into the P site for the next cycle of elongation. 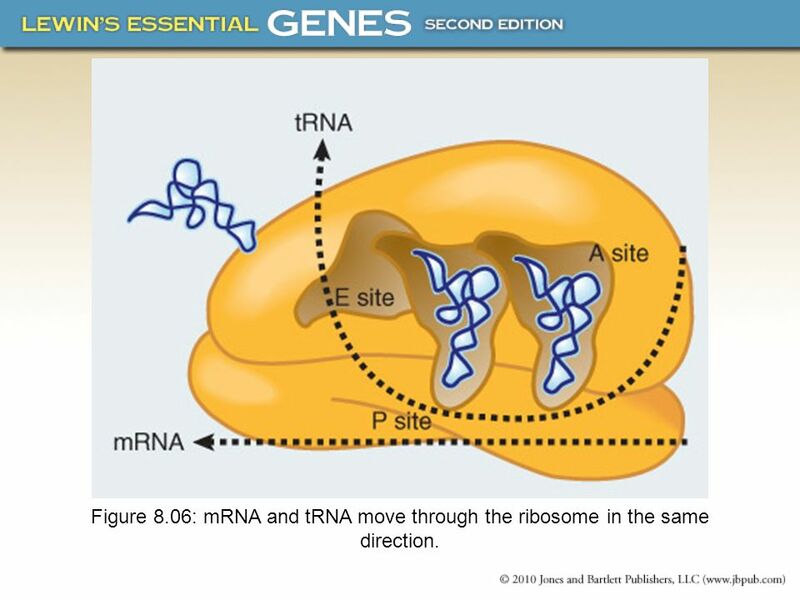 9 Figure 8.06: mRNA and tRNA move through the ribosome in the same direction. 10 Figure 8.07: Translation falls into three stages : initiation, elongation, termination. 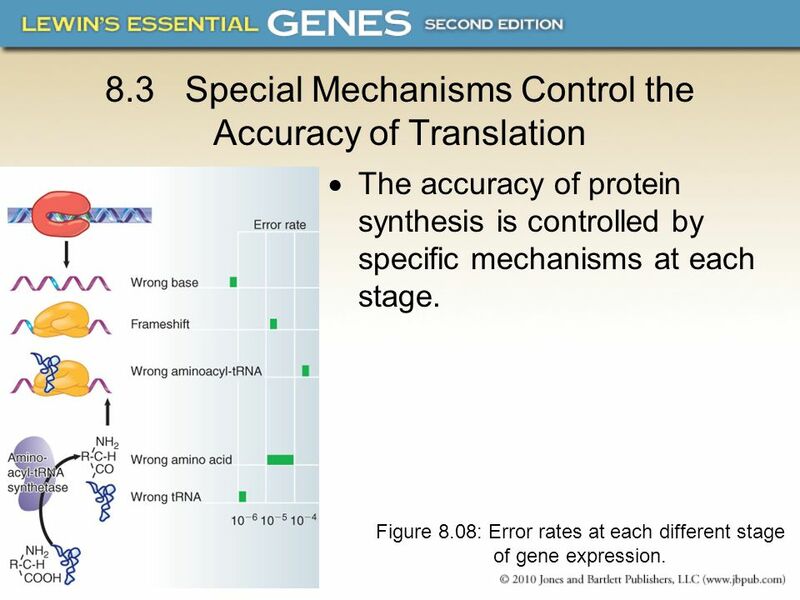 The accuracy of protein synthesis is controlled by specific mechanisms at each stage. Figure 8.08: Error rates at each different stage of gene expression. Initiation of protein synthesis requires separate 30S and 50S ribosome subunits. 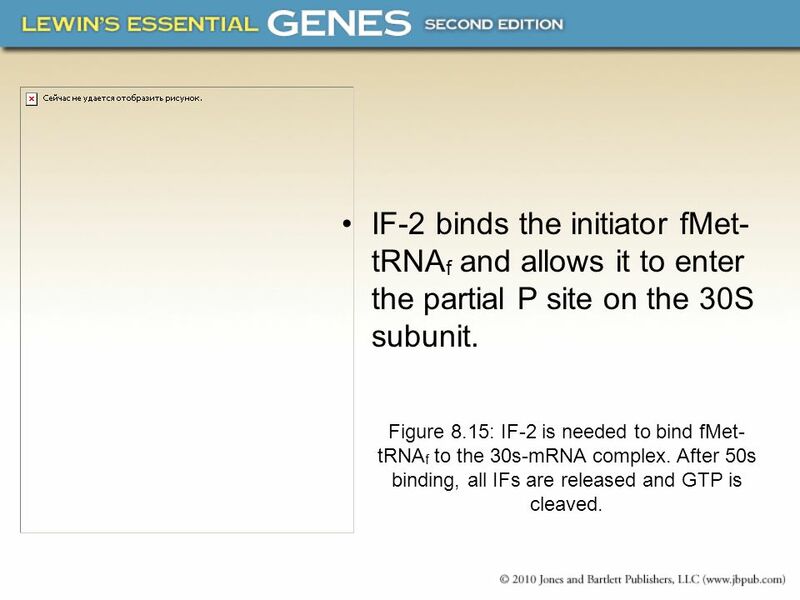 Initiation factors (IF-1, -2, and -3), which bind to 30S subunits, are also required. A 30S subunit carrying initiation factors binds to an initiation site on mRNA to form an initiation complex. 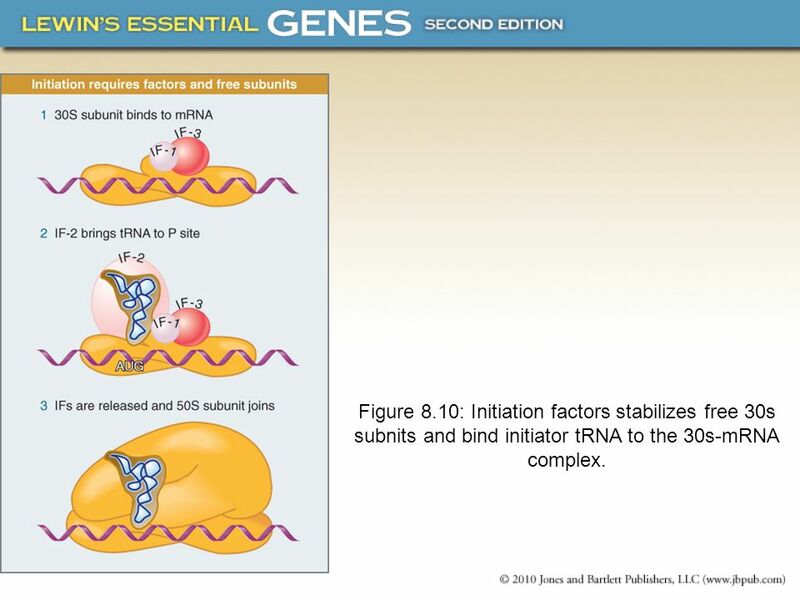 14 Figure 8.10: Initiation factors stabilizes free 30s subnits and bind initiator tRNA to the 30s-mRNA complex. 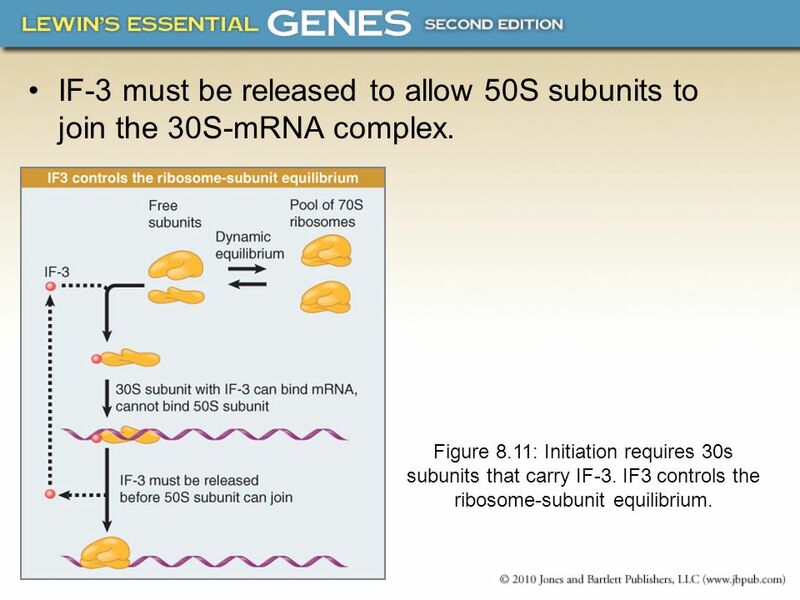 15 IF-3 must be released to allow 50S subunits to join the 30S-mRNA complex. 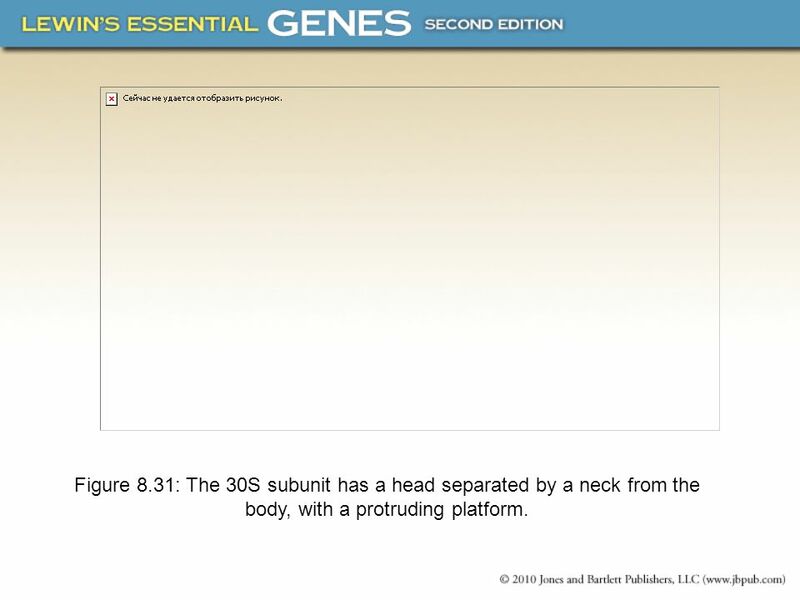 Figure 8.11: Initiation requires 30s subunits that carry IF-3. 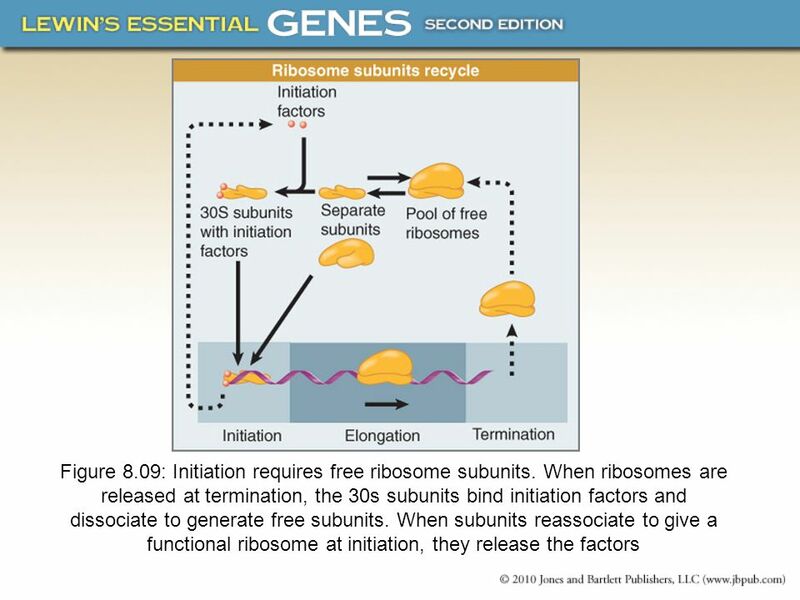 IF3 controls the ribosome-subunit equilibrium. 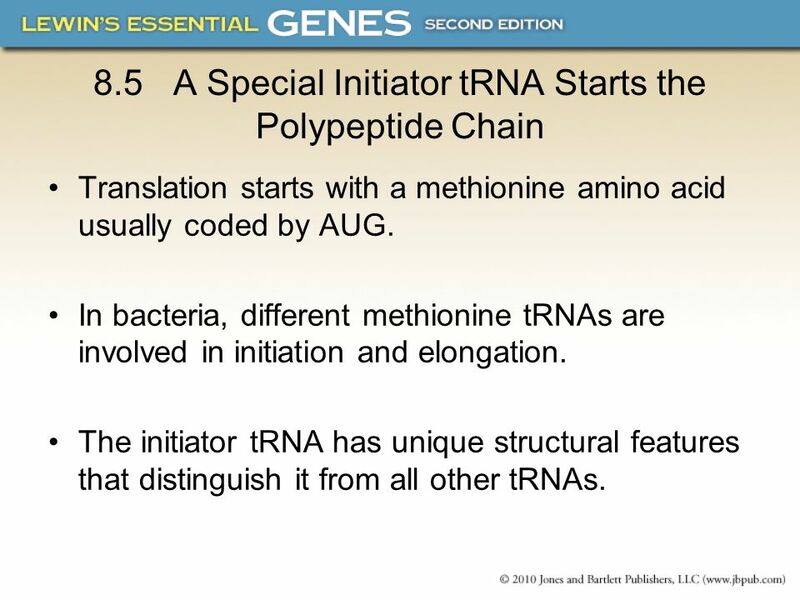 Translation starts with a methionine amino acid usually coded by AUG. In bacteria, different methionine tRNAs are involved in initiation and elongation. The initiator tRNA has unique structural features that distinguish it from all other tRNAs. 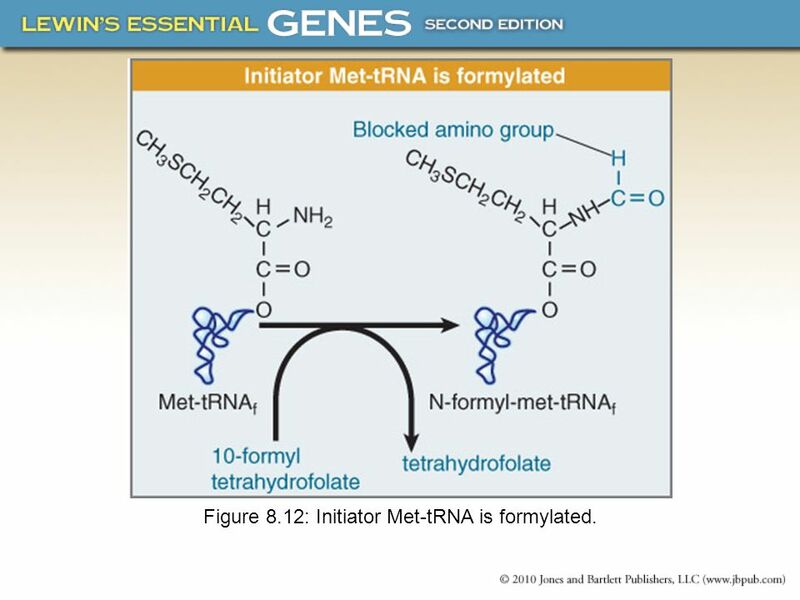 17 Figure 8.12: Initiator Met-tRNA is formylated. 18 Figure 8.13: Initiator tRNA has distinct features. An initiation site on bacterial mRNA consists of the AUG initiation codon preceded with a gap of ~10 bases by the Shine–Dalgarno polypurine hexamer. 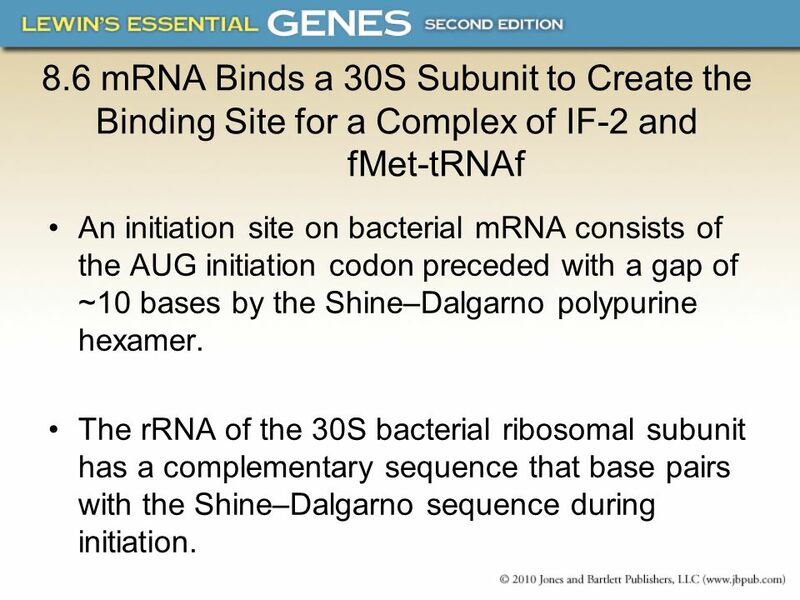 The rRNA of the 30S bacterial ribosomal subunit has a complementary sequence that base pairs with the Shine–Dalgarno sequence during initiation. 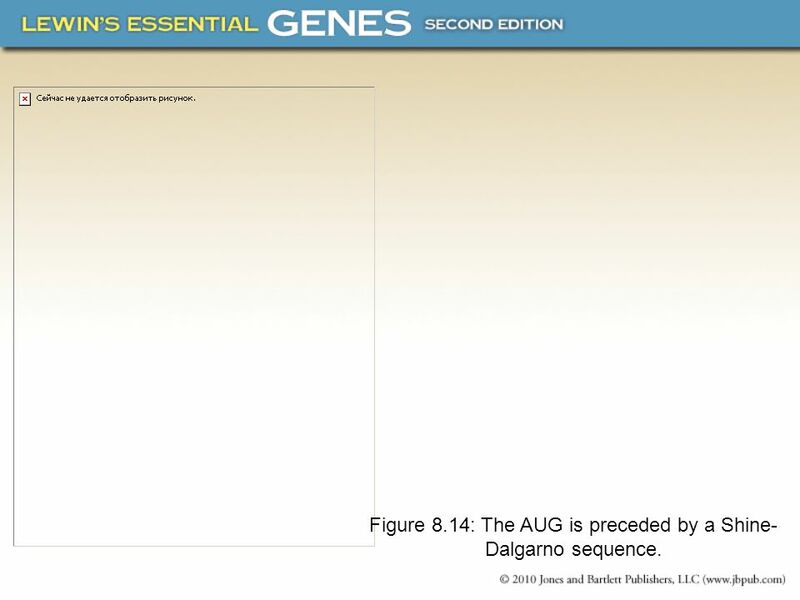 20 Figure 8.14: The AUG is preceded by a Shine-Dalgarno sequence. 21 IF-2 binds the initiator fMet-tRNAf and allows it to enter the partial P site on the 30S subunit. 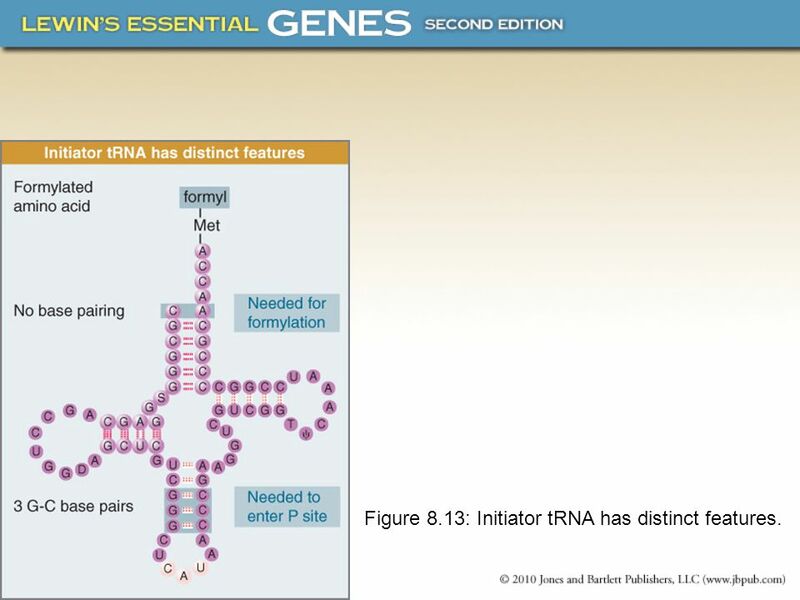 Figure 8.15: IF-2 is needed to bind fMet-tRNAf to the 30s-mRNA complex. After 50s binding, all IFs are released and GTP is cleaved. 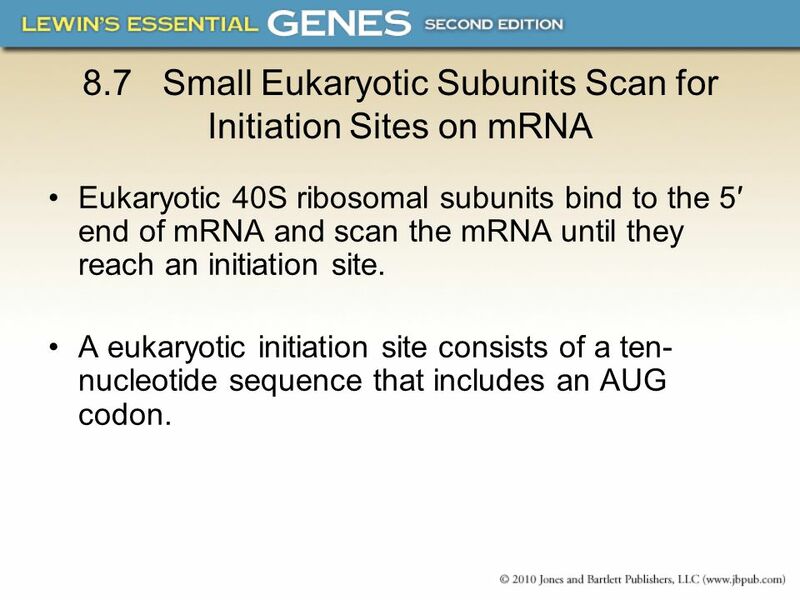 Eukaryotic 40S ribosomal subunits bind to the 5′ end of mRNA and scan the mRNA until they reach an initiation site. 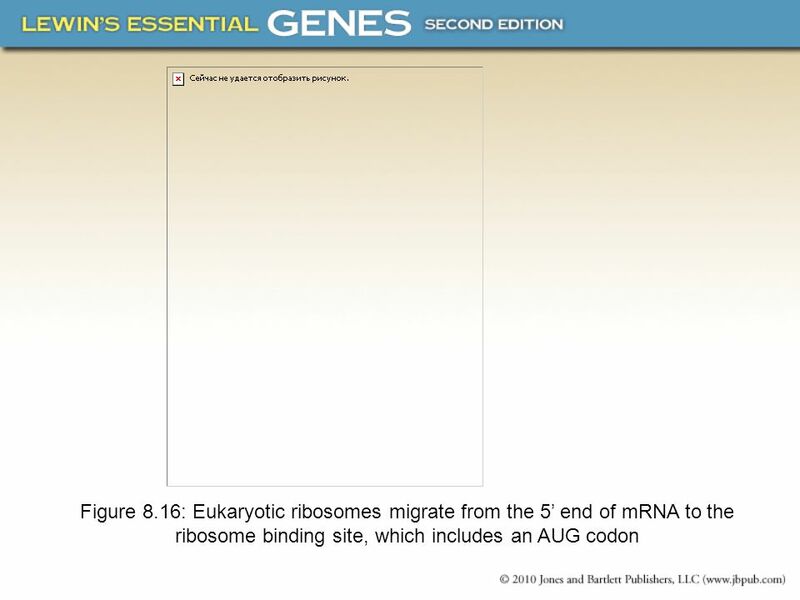 A eukaryotic initiation site consists of a ten-nucleotide sequence that includes an AUG codon. 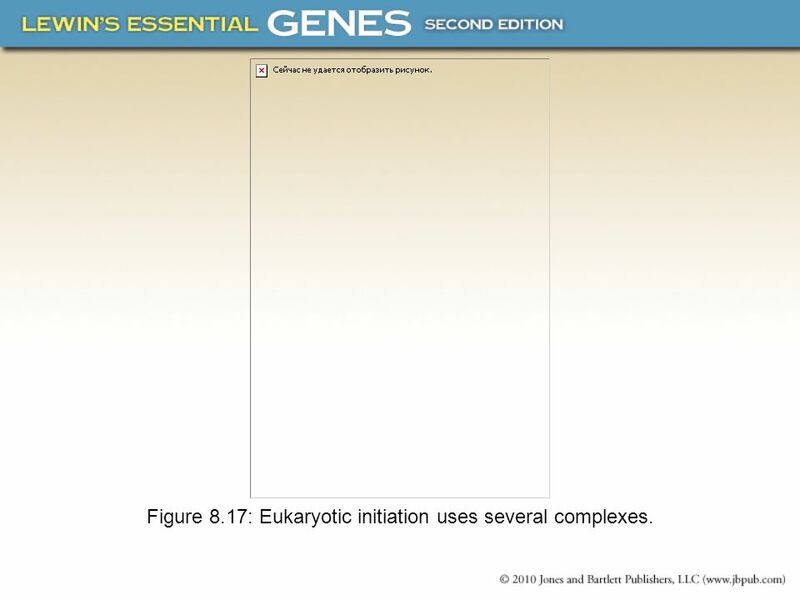 24 Figure 8.17: Eukaryotic initiation uses several complexes. 25 eIF2 and eIF3 bind the initiator Met-tRNAi and GTP. 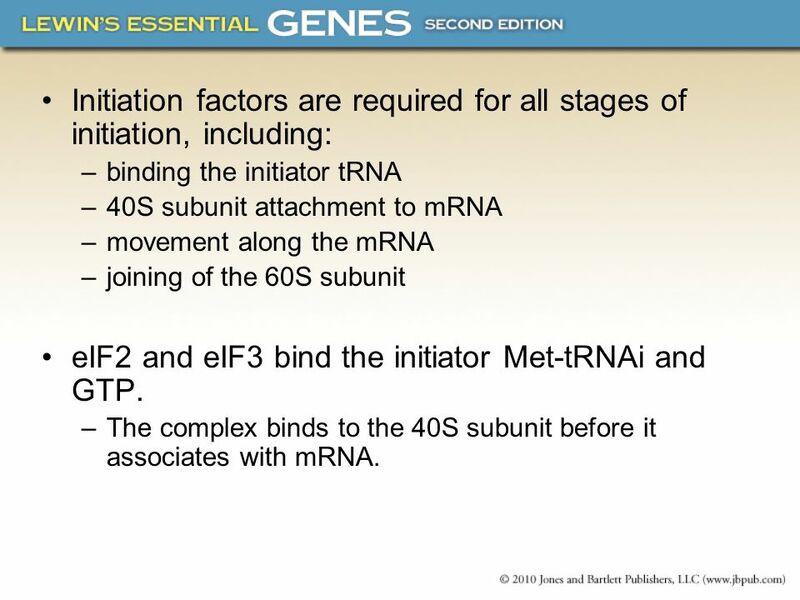 Initiation factors are required for all stages of initiation, including: binding the initiator tRNA 40S subunit attachment to mRNA movement along the mRNA joining of the 60S subunit eIF2 and eIF3 bind the initiator Met-tRNAi and GTP. 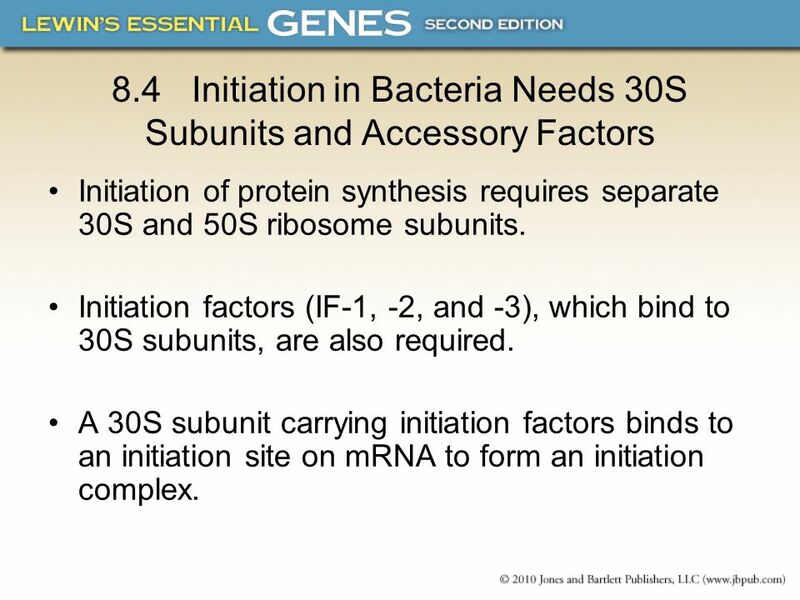 The complex binds to the 40S subunit before it associates with mRNA. 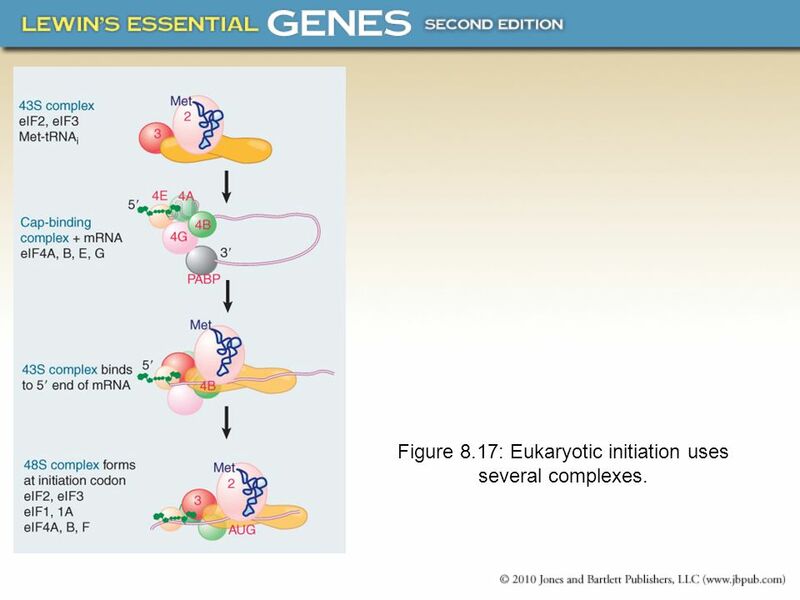 26 Figure 8.17: Eukaryotic initiation uses several complexes. 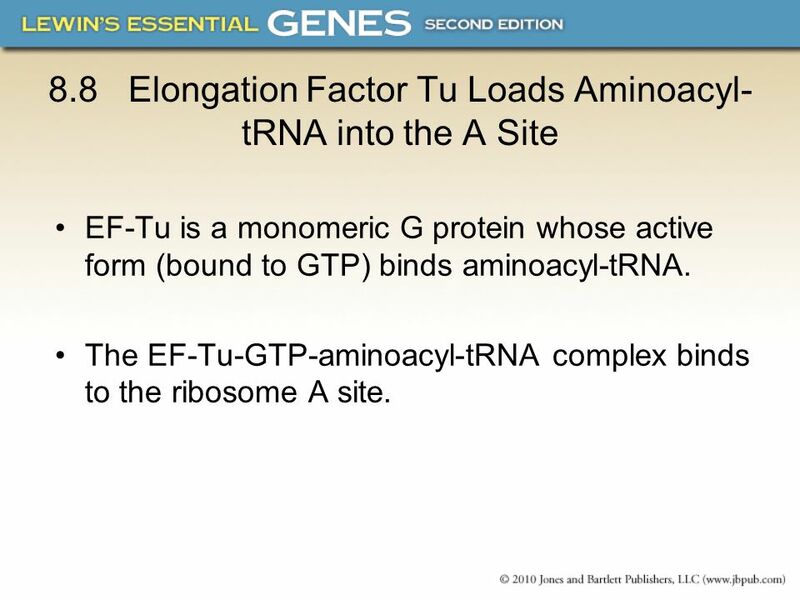 EF-Tu is a monomeric G protein whose active form (bound to GTP) binds aminoacyl-tRNA. The EF-Tu-GTP-aminoacyl-tRNA complex binds to the ribosome A site. 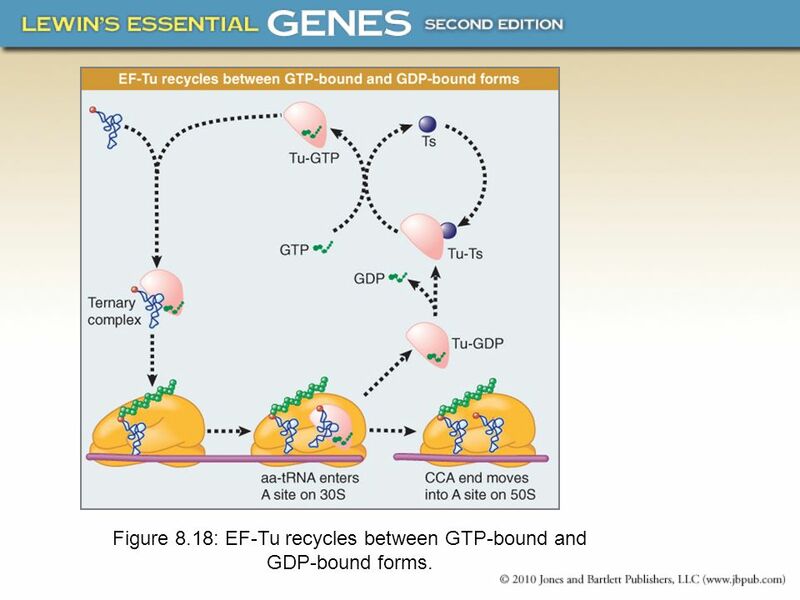 28 Figure 8.18: EF-Tu recycles between GTP-bound and GDP-bound forms. The 50S subunit has peptidyl transferase activity. 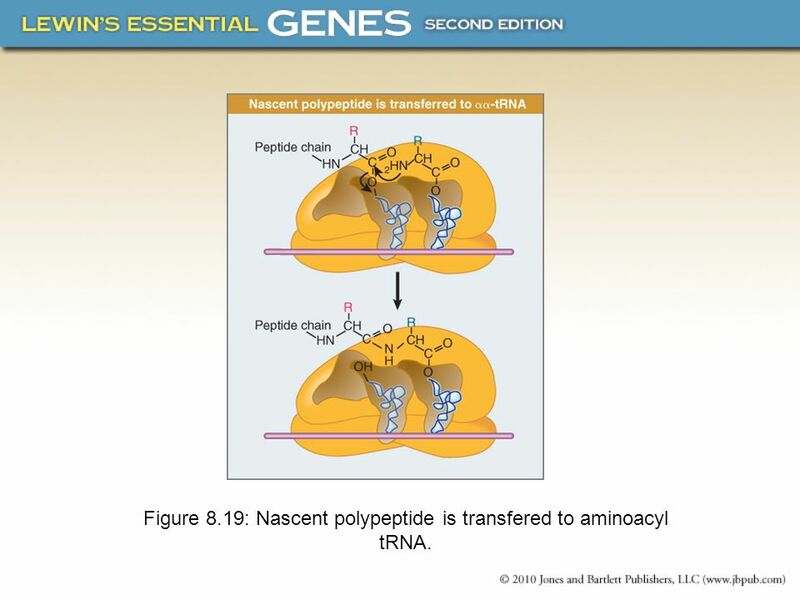 The nascent polypeptide chain is transferred from peptidyl-tRNA in the P site to aminoacyl-tRNA in the A site. Peptide bond synthesis generates deacylated tRNA in the P site and peptidyl-tRNA in the A site. 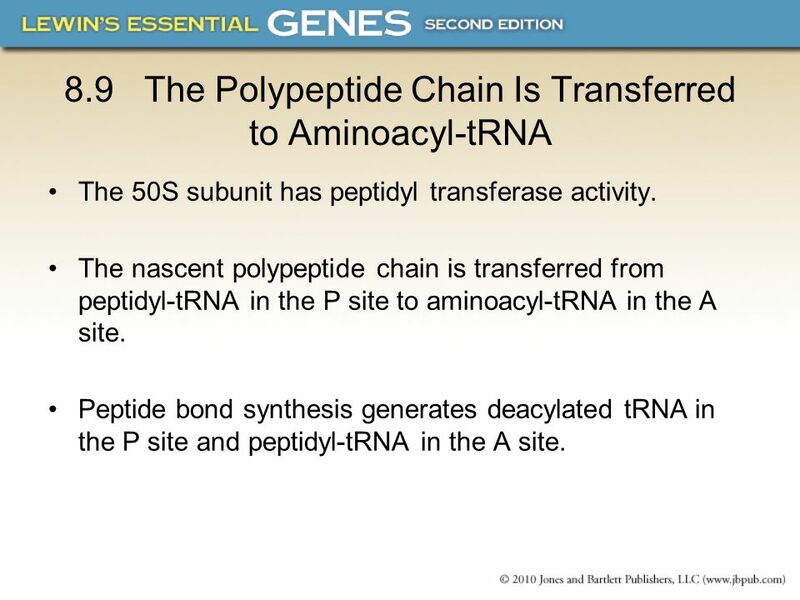 30 Figure 8.19: Nascent polypeptide is transfered to aminoacyl tRNA. 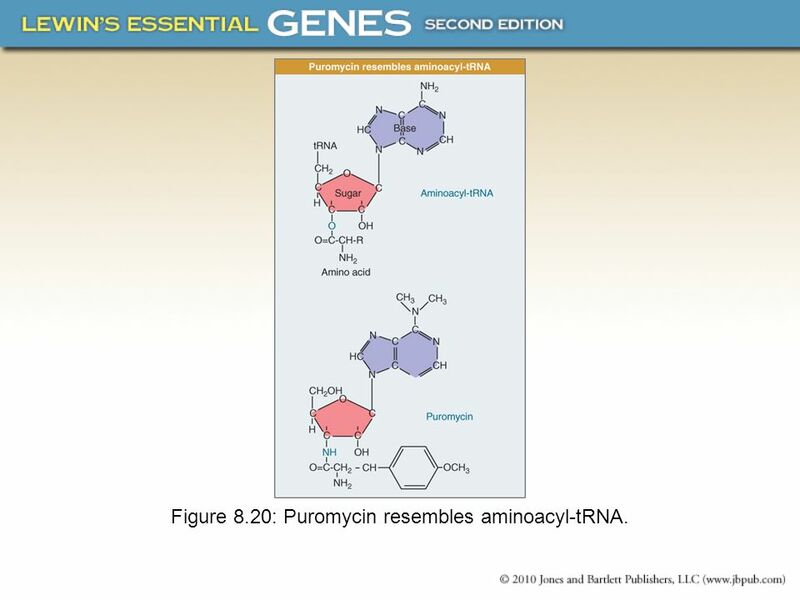 31 Figure 8.20: Puromycin resembles aminoacyl-tRNA. 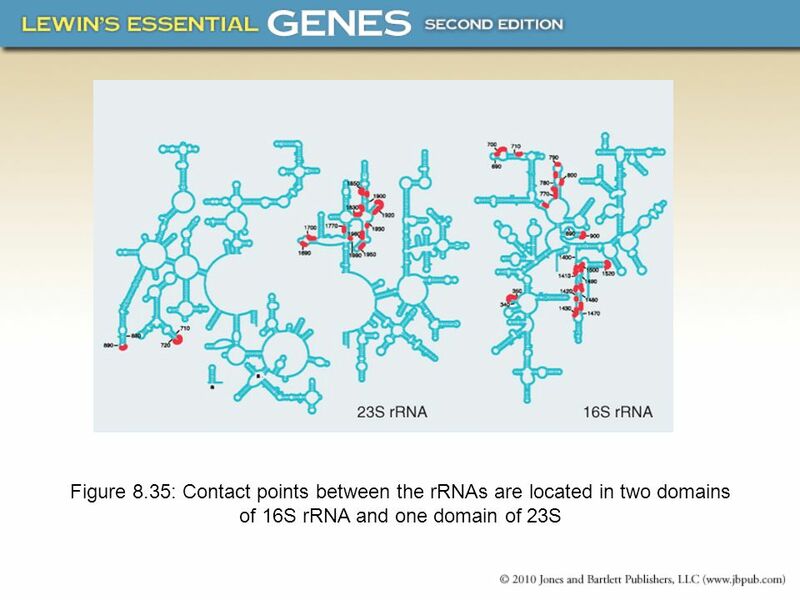 33 Figure 8.21: tRNA moves through 3 ribosome sites. The 50S moves relative to the 30S. 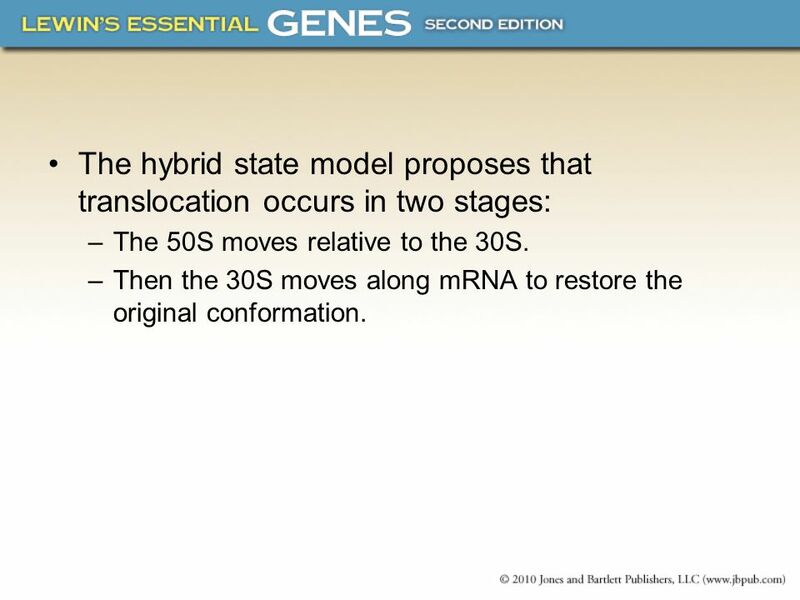 Then the 30S moves along mRNA to restore the original conformation. 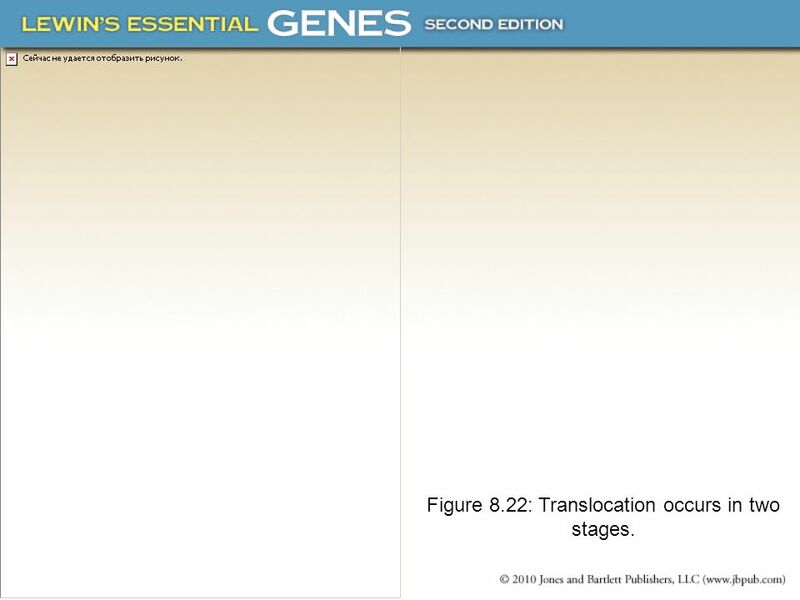 35 Figure 8.22: Translocation occurs in two stages. Translocation requires EF-G, whose structure resembles the aminoacyl-tRNA-EF-Tu-GTP complex. 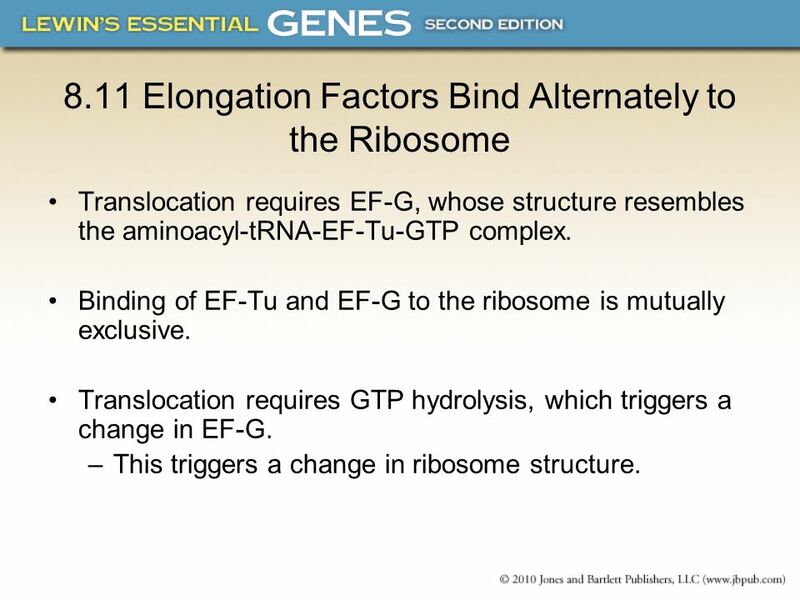 Binding of EF-Tu and EF-G to the ribosome is mutually exclusive. Translocation requires GTP hydrolysis, which triggers a change in EF-G. This triggers a change in ribosome structure. 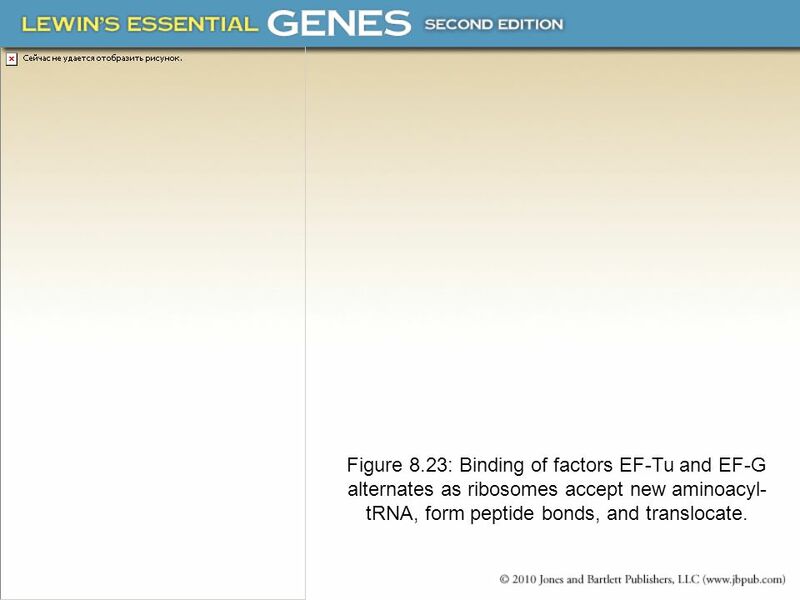 37 Figure 8.23: Binding of factors EF-Tu and EF-G alternates as ribosomes accept new aminoacyl- tRNA, form peptide bonds, and translocate. Poor growth conditions cause bacteria to produce the small molecule regulators ppGpp and pppGpp. The trigger is the entry of uncharged tRNA into the ribosomal A site. This activates the (p)ppGpp synthetase of the stringent factor RelA. 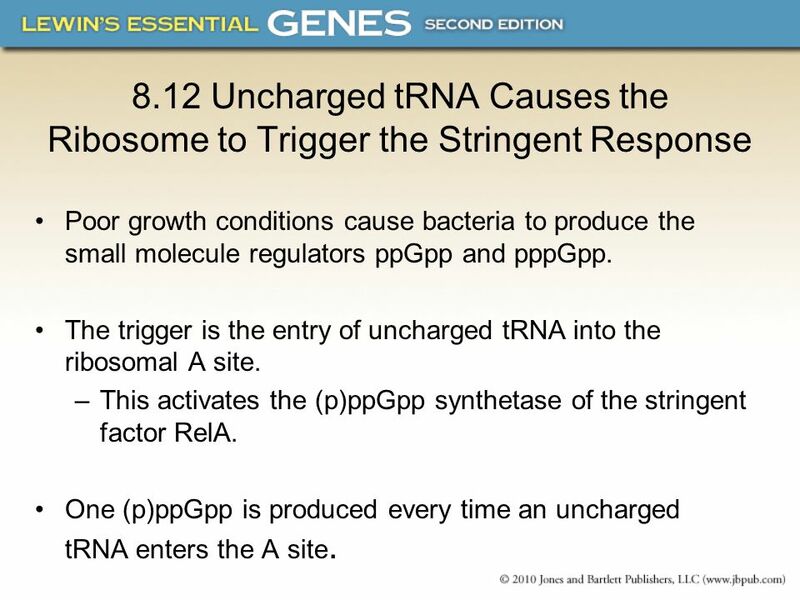 One (p)ppGpp is produced every time an uncharged tRNA enters the A site. 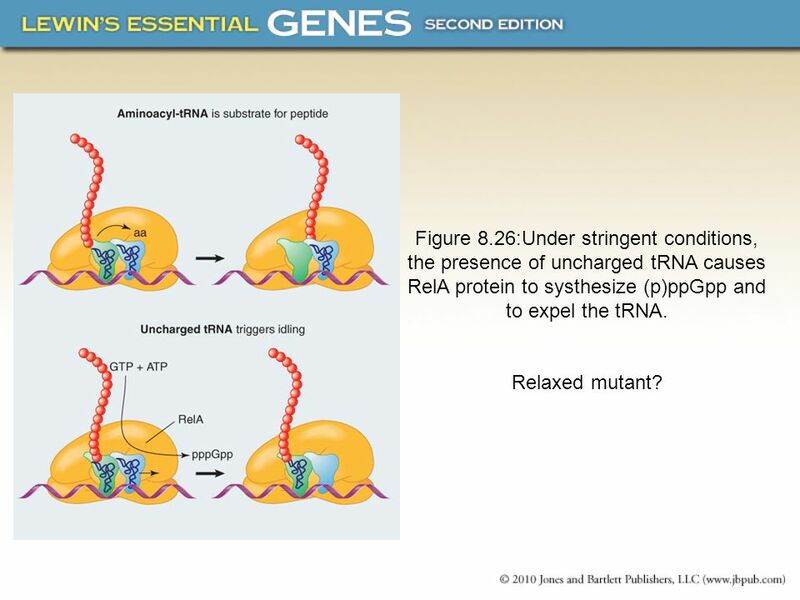 39 Figure 8.26:Under stringent conditions, the presence of uncharged tRNA causes RelA protein to systhesize (p)ppGpp and to expel the tRNA. Relaxed mutant? 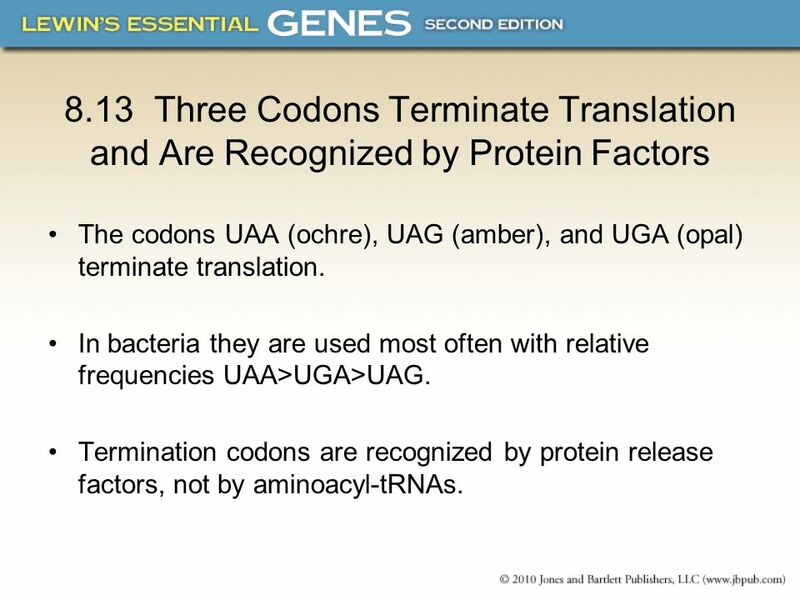 The codons UAA (ochre), UAG (amber), and UGA (opal) terminate translation. In bacteria they are used most often with relative frequencies UAA>UGA>UAG. Termination codons are recognized by protein release factors, not by aminoacyl-tRNAs. 41 Figure 8.27: Several factors have similar shapes. 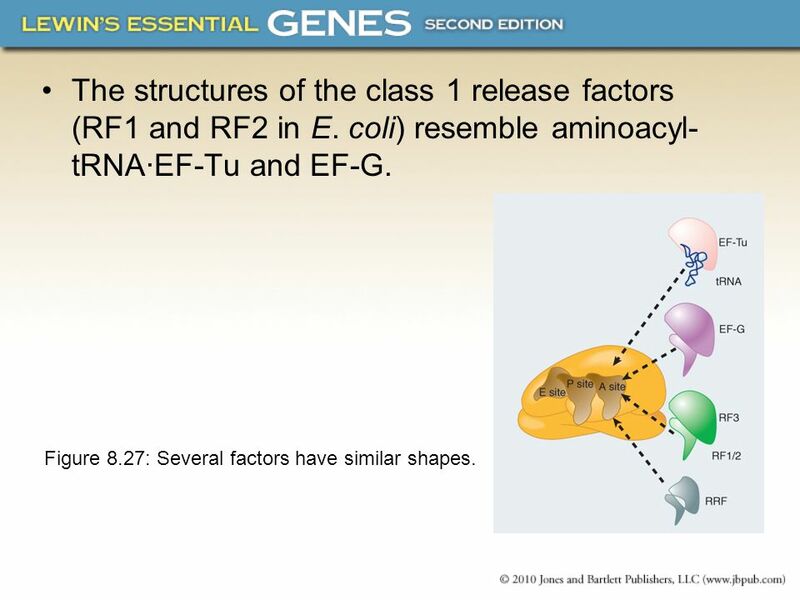 The structures of the class 1 release factors (RF1 and RF2 in E. coli) resemble aminoacyl-tRNA·EF-Tu and EF-G. Figure 8.27: Several factors have similar shapes. 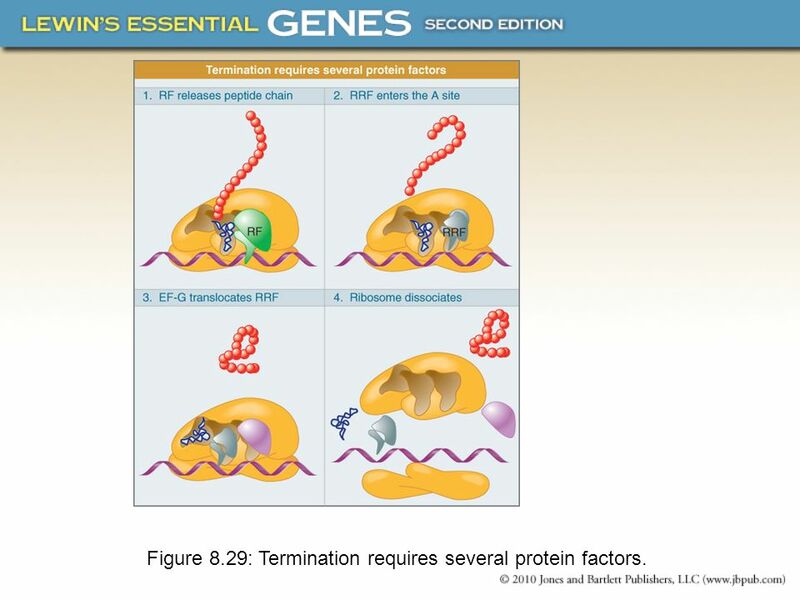 43 Figure 8.29: Termination requires several protein factors. 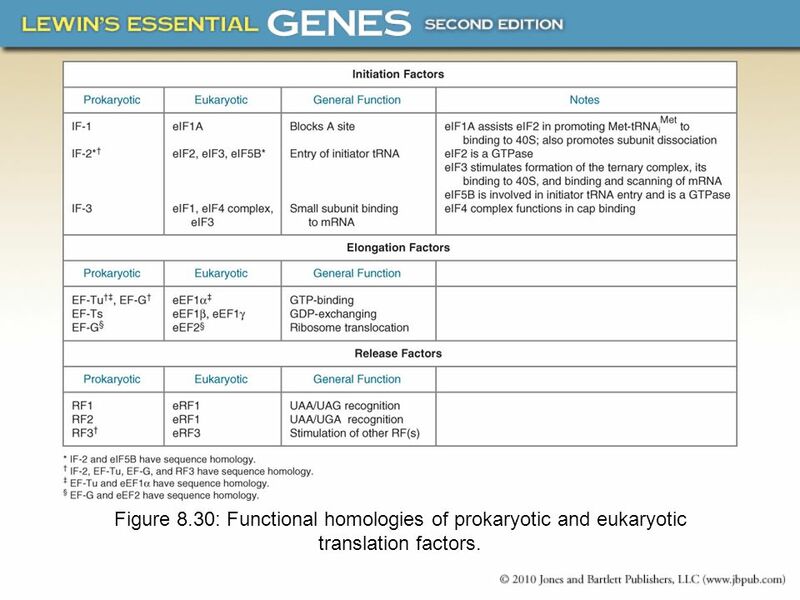 44 Figure 8.30: Functional homologies of prokaryotic and eukaryotic translation factors. Each rRNA has several distinct domains that fold independently. 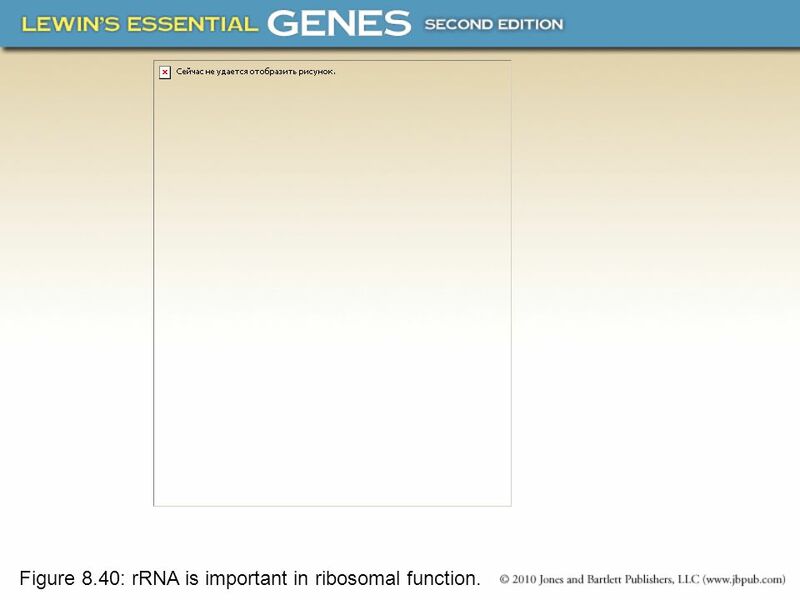 Virtually all ribosomal proteins are in contact with rRNA. 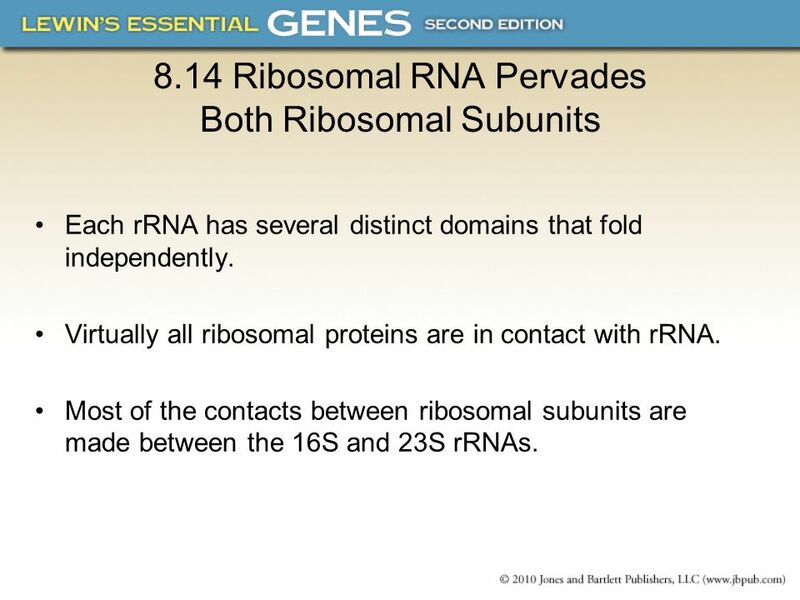 Most of the contacts between ribosomal subunits are made between the 16S and 23S rRNAs. 46 Figure 8.31: The 30S subunit has a head separated by a neck from the body, with a protruding platform. 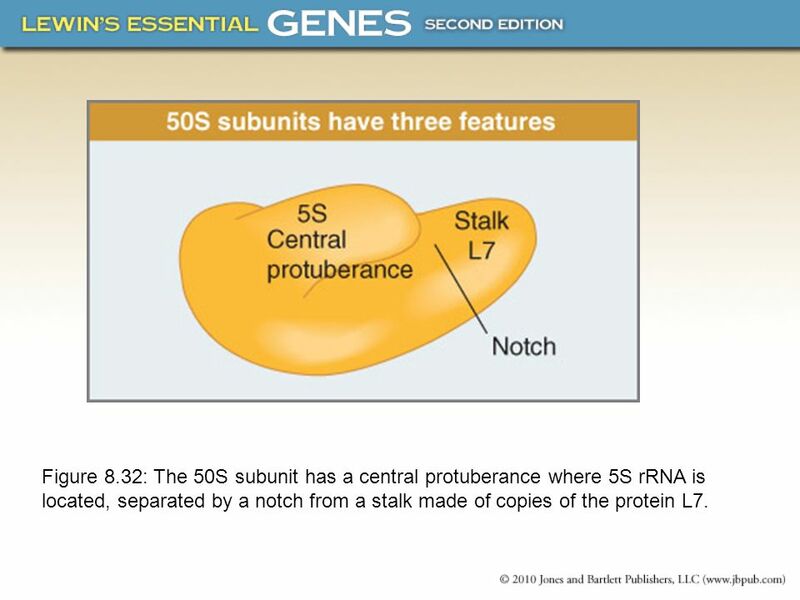 47 Figure 8.32: The 50S subunit has a central protuberance where 5S rRNA is located, separated by a notch from a stalk made of copies of the protein L7. 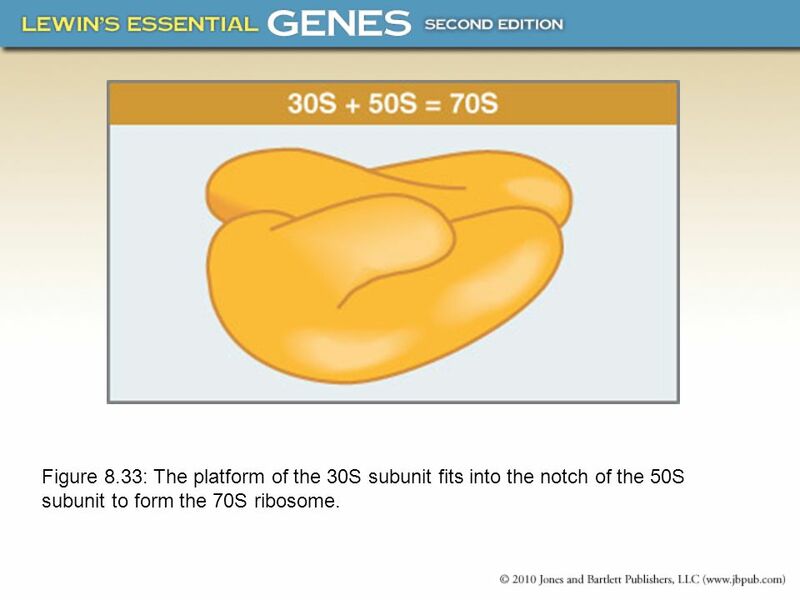 48 Figure 8.33: The platform of the 30S subunit fits into the notch of the 50S subunit to form the 70S ribosome. 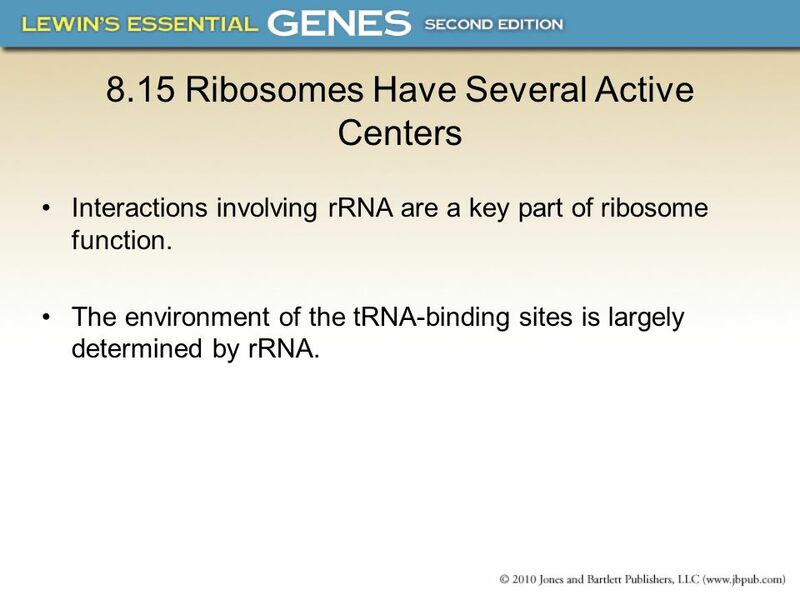 Interactions involving rRNA are a key part of ribosome function. The environment of the tRNA-binding sites is largely determined by rRNA. 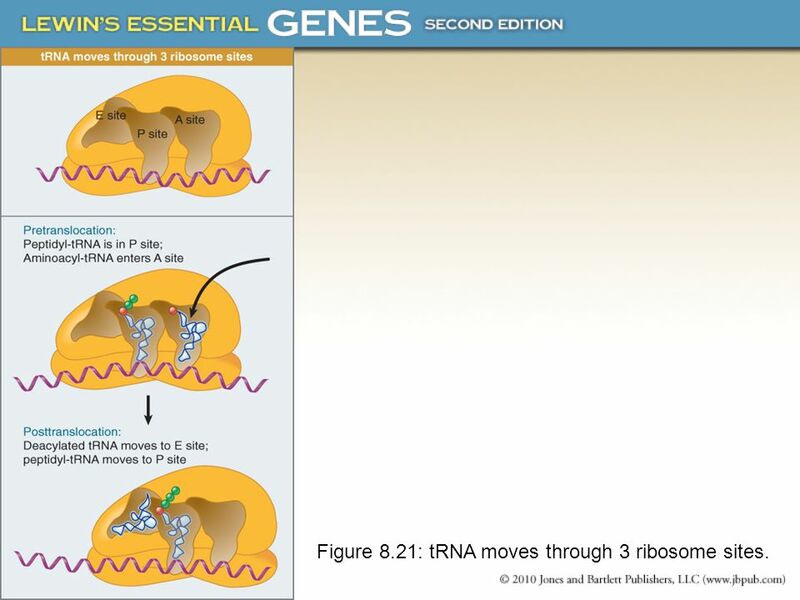 51 Figure 8.37: The ribosome carries three tRNAs. 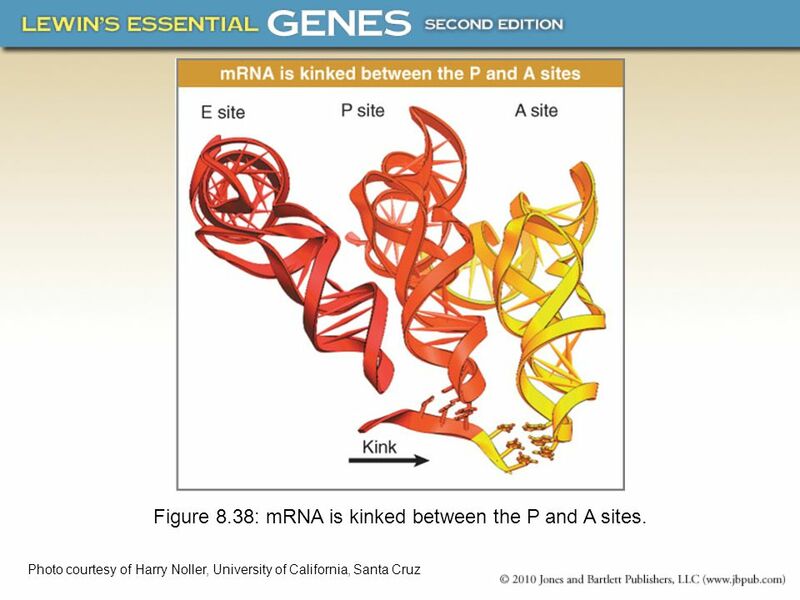 52 Figure 8.38: mRNA is kinked between the P and A sites. 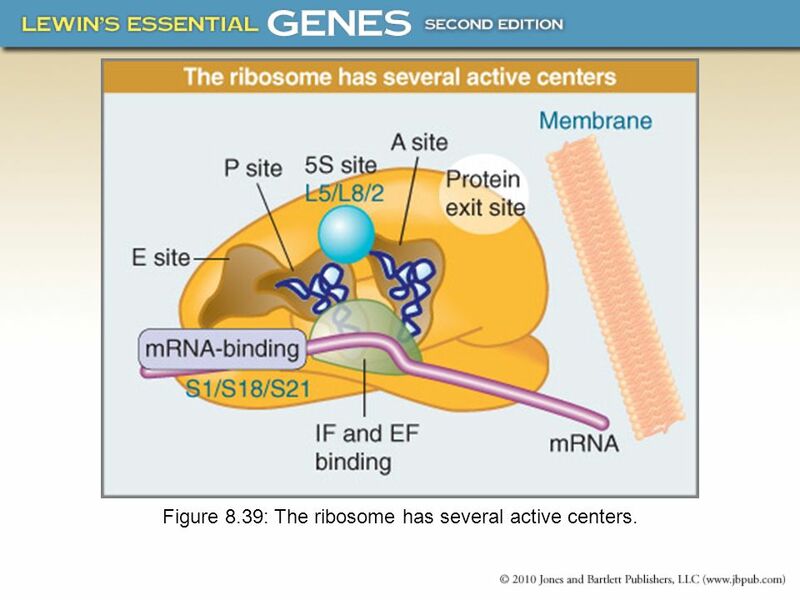 53 Figure 8.39: The ribosome has several active centers. 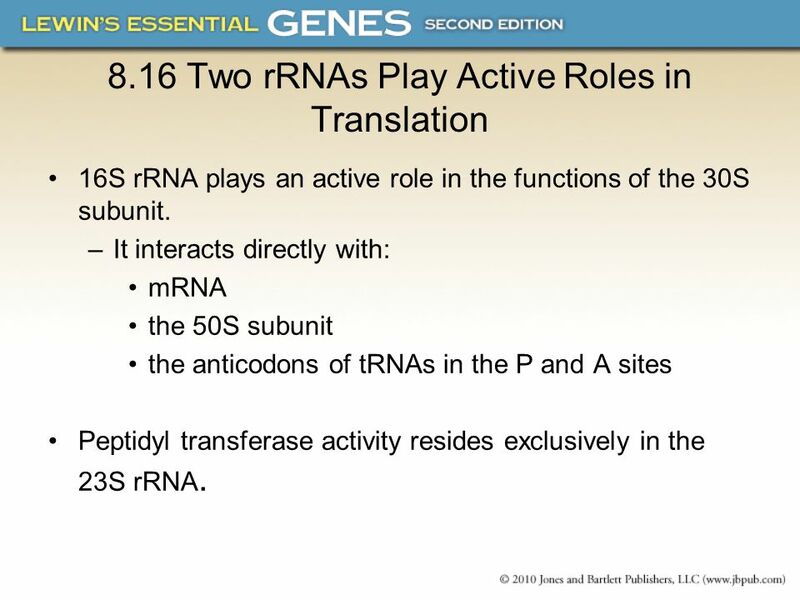 16S rRNA plays an active role in the functions of the 30S subunit. It interacts directly with: mRNA the 50S subunit the anticodons of tRNAs in the P and A sites Peptidyl transferase activity resides exclusively in the 23S rRNA. 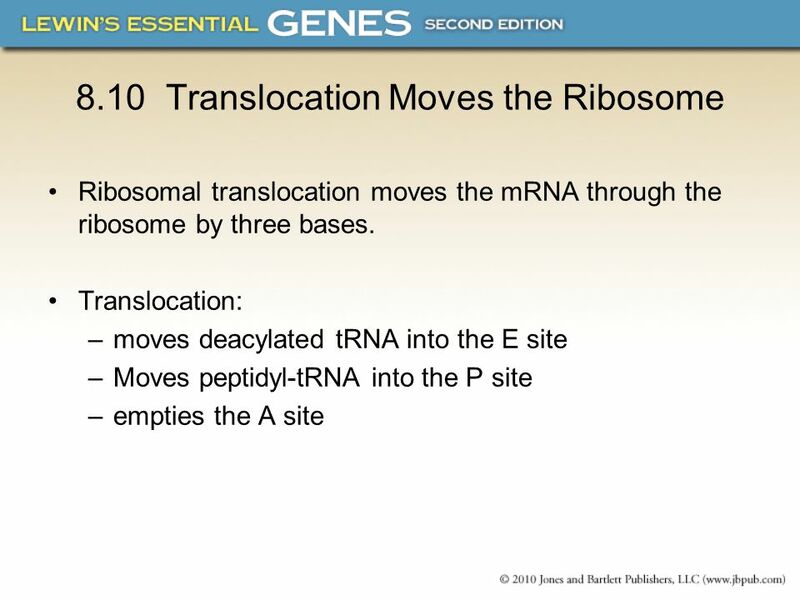 55 Figure 8.40: rRNA is important in ribosomal function. 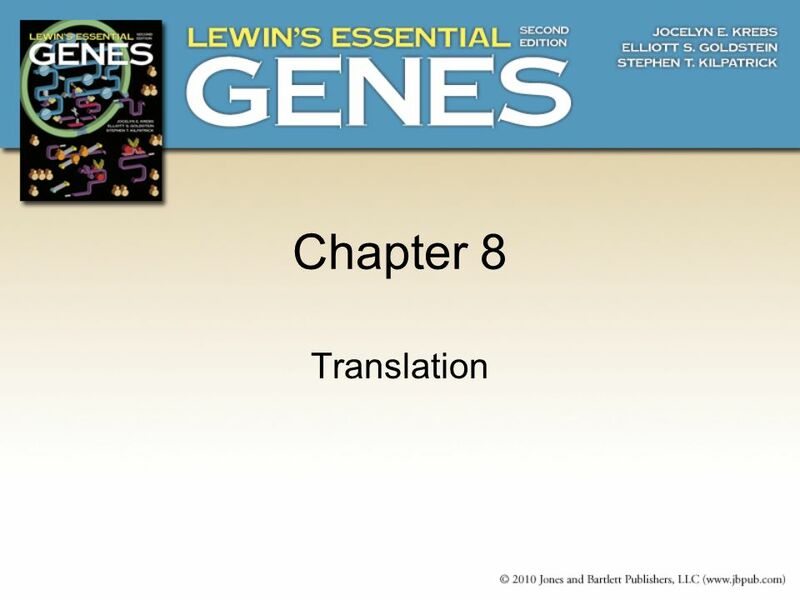 Download ppt "Chapter 8 Translation." Protein Synthesis Prof.Dr. Gönül Kanıgür. Sections & The genetic code is _________, meaning that an amino acid may be coded by more than one codon. unambiguous degenerate. G. Structures of tRNAs (a) tRNAs are 73~93 nucleotides long. (b) Contain several modified nucleotides. (c) The anticodon loop and the 3’ CCA of the acceptor. 13-13 Copyright ©The McGraw-Hill Companies, Inc. Permission required for reproduction or display. Two Stage Processes of Gene Expression Transcription: - mRNA - tRNA - rRNA Translation: - mRNA translated to Protein - tRNA & rRNA provide other components. Two Hybrid. 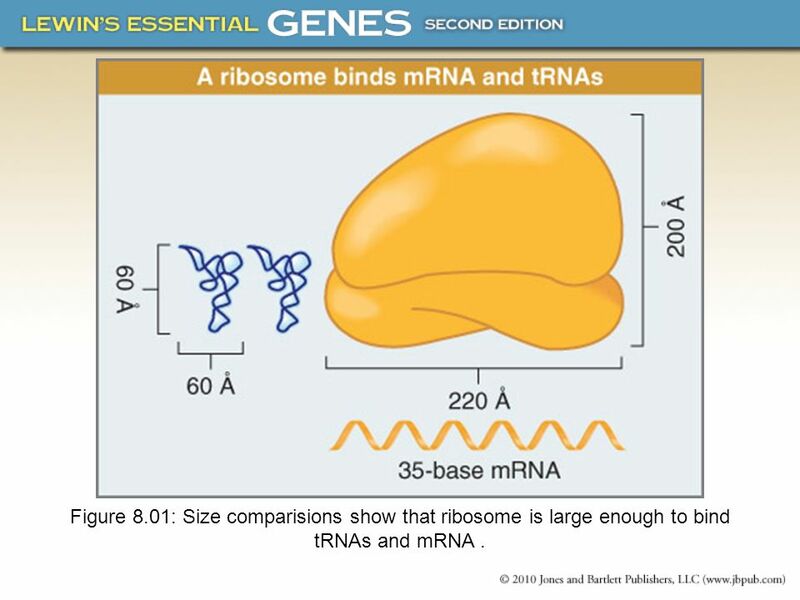 Chapter 24 Translation 24.1 Introduction Figure 24.01: Size comparisons show that the ribosome is large enough to bind tRNAs and mRNA. Central Dogma Cytoplasm of eukaryote Cytoplasm of prokaryote DNAmRNA Protein transcription translation replication Translation converts sequence of bases. FCH 532 Lecture 19 This material will not be on the exam Chapter 32: Translation. (CHAPTER 13- Brooker Text) Translation Sept 25, 2008 BIO 184 Dr. Tom Peavy. Chapter 6 Protein synthesis. 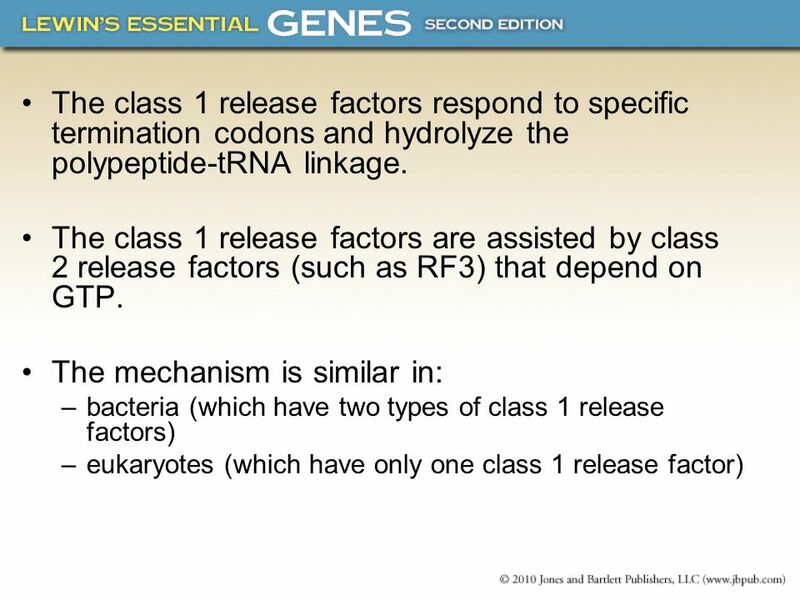 6.1 Introduction 6.2 The stages of protein synthesis 6.3 Initiation in bacteria needs 30S subunits and accessory factors. Chapter 22 (Part 2) Protein Synthesis. Translation Slow rate of synthesis (18 amino acids per second) In bacteria translation and transcription are coupled. 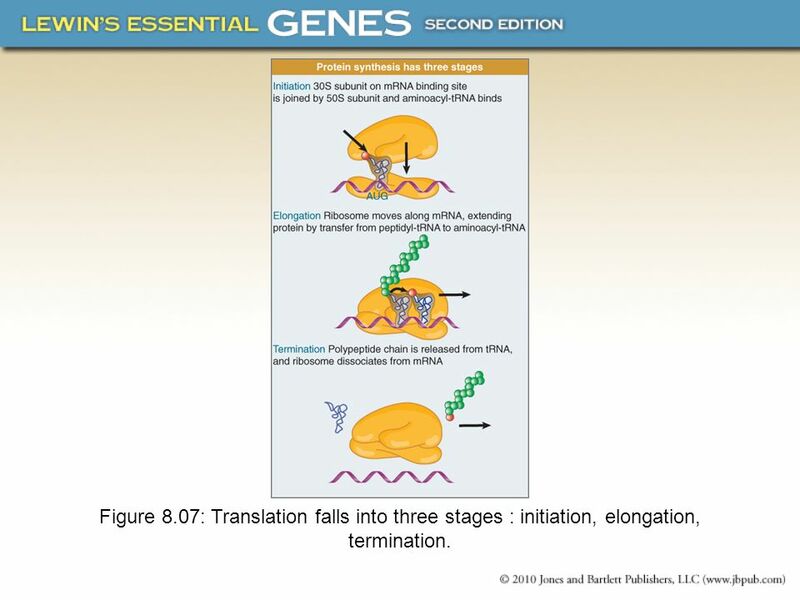 Copyright, ©, 2002, John Wiley & Sons, Inc.,Karp/CELL & MOLECULAR BIOLOGY 3E Translation Initiation, Elongation, Termination.